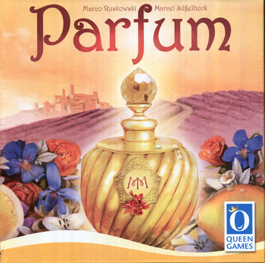 "Parfum" transports players to the wonderful world of fragrances, which dates back hundreds of years to when aromatic scents were first used in the Orient in myriad ways. As master perfumers, players distil precious essences and create unique perfumes using ingredients like vanilla and lavender. But each customer has their own preferences, so even the most charming symphony of fragrances must satisfy the tastes of the wealthy clientele. Choose your aroma dice skilfully and mind well your client's desires in order to become the most successful perfumer.